SHE INSPIRED HER: Power Women Michelle Obama, Sarah Jessica Parker and Kerry Washington unite to grace the front page of GLAMOUR this May! 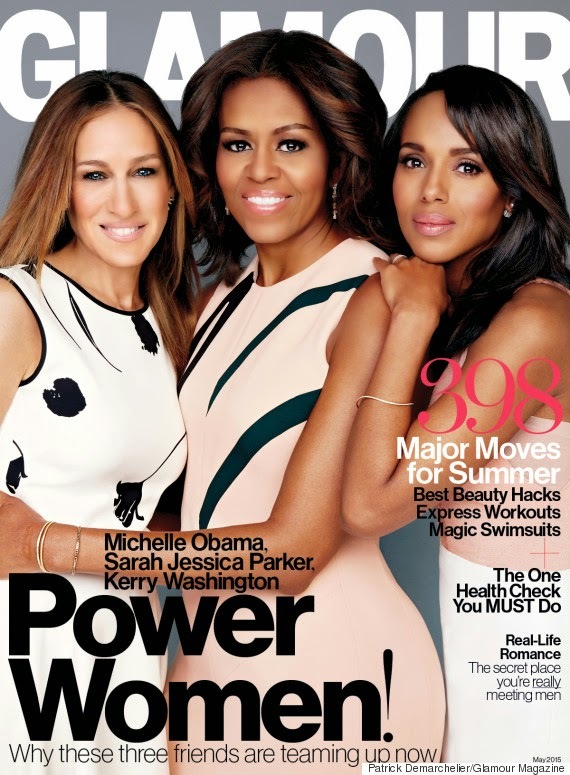 Power Women Michelle Obama, Sarah Jessica Parker and Kerry Washington unite to grace the front page of GLAMOUR this May! Sarah Jessica Parker, Michelle Obama and Kerry Washington all look powerfully stunning as the trio grace the front page of the May 2015 cover of GLAMOUR Magazine! All three women are glowing on the front page and inside the publication in images taken by Photographer Patrick Demarchelier. Kerry Washington aged 38 and Sarah Jessica Parker aged 50 are both involved in the presidents committee on the Arts and the Humanities. Mrs. Obama aged 51, has long been an advocate for veterans, having launched Joining Forces in 2011, an initiative that asks Americans to rally around service members, veterans, and their families to support them through wellness, education, and employment programs. During her earlier days as First Lady, Obama recalled hearing the stories of many of the servicewomen and their struggles to find work and suitable health care after having served. Obama said "During the first campaign one of my jobs as my husband's spouse was to travel around the country and really listen to women... We held small discussion groups, [and] there were voices that were new to me: voices of military spouses, many of them women, and veterans." Scandal star, Washington's father served in the military before she was born, which made the cause hit close to home for her and Parker, whom has friends in uniform has a great amount of respect for those who have served and wanted to know how else she could help. The purpose of their unity, in this instance, is to bring awareness and aid to military women and families, with each having a passion for the cause. Alongside looking absolutely fabulous this trio of women intend to assist veterans and military families through various programmes. We look forward to being further inspired by them in due course as this project takes shape! Get your copy of GLAMOUR in May 2015 to read and see more!